Today, Golden 1 Center and ALT 94.7 announced that a portion of tickets sold for Electric Christmas on Saturday, December 8 will go toward the American Red Cross California wildfires relief efforts. 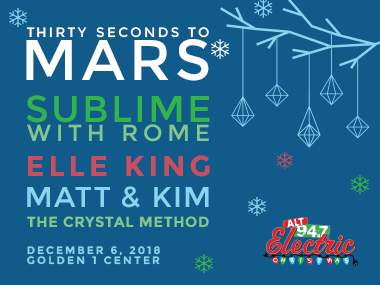 ALT 94.7 Electric Christmas 2018 will feature performances by Thirty Seconds to Mars, Sublime with Rome, Elle King, Matt & Kim and The Crystal Method. For every ticket purchased with the code REDCROSS, Golden 1 Center and ALT 94.7 will donate $10 to the American Red Cross to help the communities impacted by the devastating fires across California, including the Camp Fire in Butte County. For tickets, visit Golden1Center.com – while supplies last.